The Royal Warrant of James II dated August 1686 authorises the payment of £206 5s 6d for ten Colours for The Queen’s. As the Regiment had ten companies in 1686 it is clear that the practice of the earlier reign has been continued. 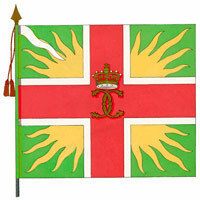 It is likely that these Colours are copies of those carried in Tangier rather than new designs, since the warrant makes no reference to any new sealed pattern. First, the Colonel’s Colour. This was green with the cipher of Queen Catherine in the centre surmounted by a royal crown. Other regiments would here have displayed the arms of their Colonel, but The Queen’s had the peculiar distinction of displaying their royal Colonel’s cipher. Thirdly, the Captains’ or Company Colours followed the design of the Lieutenant Colonel’s Colour except for a distinguishing numeral in the first canton. Each Colour had the crowned cipher in the centre. It is not known at what date, where of by whom (if at all) the Tangier Colours or the 1686 Colours were presented, although the 1686 Colours were certainly carried in Ireland during William III’s campaign there. There is in existence in the State Archives in Windsor Castle a set of paintings of the 1686 Colours of The Queen’s. These show the distinguishing numerals denoting the company placed on the upper vertical arm of St George’s Cross and not, as described in other sources, in the first canton. Bearing in mind the amount of inconsistency rife at that time, which I have highlighted, it remains a matter of conjecture as to where the numerals were actually placed.